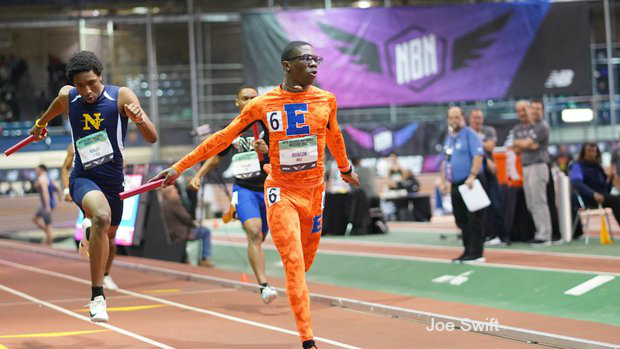 Our esteemed critique blogger B-side recently stated this about the NBNI: "This is the indoor meet of meets and everyone need not apply for this one." The E. St. Louis Sr. boys program with its rich history of track and field that stretches many generations applied and expected to get the assignment in the Big Apple. The Flyers know about tough settings as they have always taken their opponents best shots on or off the field of competition and survived. 2019 so far feels different for the Flyers. ESL was a late entry to participate in the Big Apple festivities so they were rendered to the emerging elite classification. That on the surface may sound like disrespect but it could not be further from the truth. First up to compete would be junior Willie Johnson. The last major competition for Johnson was last summer when he won his age group AAU 400m title. In this affair, it would be section one of 10 that a strong performance would need to be made. Johnson hit the first lap in 23.07 and was in complete control on the backstretch. As he crossed the line in a new speckled appearance, he was clearance delighted by the performance- the finish clocked rang out 48.39. The great performance now sits atop the state rankings and #14 in the country. The Flyers showed tremendous resolve being in the stadium most of the day because they had to compete in several relays. The first was the 4x200 and an outside lane 6 draw. Horrendous transition followed by bad tight-rope running as if they were being bitten by Cobra snakes. The Flyer runners clearly had never run on a banked track before and then hit the rail a few times. Thanks to new superhero Johnson and his 21.75 anchor leg, the Flyers prevailed for the win in another state-best 1:30.00. Several hours later and clearly worn out from a long day, the Flyers muscled another title via the 4x400m. Johnson ran the second leg this team and held form with a 50.22 split. The other mates clocked 50.94, 50.53, and the anchor in 50.38. The time was a solid 3:22.09 but more importantly, left an imprint on themselves and the appreciative crowd. Sophomore Rhiannon Held of Mt. Zion wants to step in her big sister Josie Held's footsteps. Josie competed in several indoor nationals which set her up to become a state champion last year. Josie is now vaulting for the University of Illinois. Rhiannon entered the competition with four wins and clearance at 12-0. She was able to reach past 12-6.25 with only one miss. There were four other competitors sort of in the same boat but they had missed, including eventual second finishers Payton Phillips of Georgia and Abby Tershak of Virginia. The bar was moved up to 12-10.25 where all five girls missed of course. But Rhiannon was ruled the champion. The new emerging elite national champion will have a springboard upon her return home stoked with a gold medal and a US #22 ranking. Senior Jack Roberts of Downers Grove North made a solid presence on the distance end for the boys. Entered in the emerging elite 2-mile, Roberts led early on before falling back when the pace picked up just after the first mile. Roberts was able to weather several strong storm surges and place 4th in 9:22.90. Chicago Whitney Young junior Lovie Annafi competed in two emerging elite field events for the girls. The first was the long jump and that seemed to loosen her up in the hostile NYC environment. Annafi only placed 15th jumping 17-4.5. The triple jump was much better and more consistent as she took 7th with a personal best 38-0.